Milledgeville is really getting into the holiday spirit this year! Drive around town and you’ll spot an assortment of blow up Santas, flashing Christmas lights and wreaths galore. But where should you go to see the best of the best? We’ll help you out with that! Pecan Grove at Central State Hospital: After checking out the spooky sites at Central State Hospital during the daytime, make sure to come back at night and see the decorations in the center pecan grove. 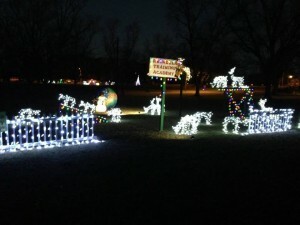 Set up on both sides of the grove, toy trains, Santa and classic Christmas sayings light up the night. Sponsored by local Milledgeville businesses, the pecan grove Christmas lights are a must see this holiday season! Make sure to get there before 9 PM though, since that’s when they turn off the lights for the night. Front Campus at Georgia College: Right before Thanksgiving, Georgia College students work hard to hang up garland and lights on all front campus buildings in order to celebrate the holiday season. Then, the week before finals, Georgia College students celebrate the lighting of each building while Georgia College faculty read off fun facts and the histories of each building and eat and drink yummy holiday snacks and beverages. Anyone is invited to this fun event, so keep that in mind for next Christmas! Right around sun down every night, the building are lit up and shine over the Georgia College campus. Check these out soon though, Georgia College takes them down shortly after Christmas! Downtown Milledgeville: You can’t miss these beautiful lights in downtown Milledgeville. They’ve even added a giant tree in the center this year! Set up before the first Friday event of December, Milledgeville Main Street does a great job at making sure every inch and corner of downtown is covered with Christmas cheer. They also run a contest for the local businesses downtown on who has the prettiest window display for the holidays. With themes ranging from Frozen to Santa’s workshop, each display is different and fits the mood of the restaurant it’s part of. Make sure to take a long stroll around downtown and make sure to check out every detail of lighting and window displays before it’s all gone! Residential Milledgeville: Of course, the best lights are always found just taking a nightly family drive. Whether you’re cruising by the lake checking out the beautiful lit up lake homes, or just driving down 441 with the lit up businesses speeding by, you’re sure to find something around every little Milledgeville corner. Discovering new parts of Milledgeville through family drives are what the holidays are all about, and you’ll definitely find some hidden Christmas gems down any road you turn. Just keep your eyes on the road most of the time, please! Share your pictures of Christmas Lights in Milledgeville with #ilovemilly.